Ann Arbor, MI (June 7, 2018) – The Humane Society of Huron Valley (HSHV) in partnership with the Washtenaw County Sheriff’s Department conducted a search warrant on a home of the Augusta Township Supervisor on Friday, May 25 and seized 71 animals: 37 cats, 9 dogs, 13 chickens, 10 exotic birds, and two peacocks. Investigators from HSHV found excessive feces, urine, and debris littering the yard and inside the home. 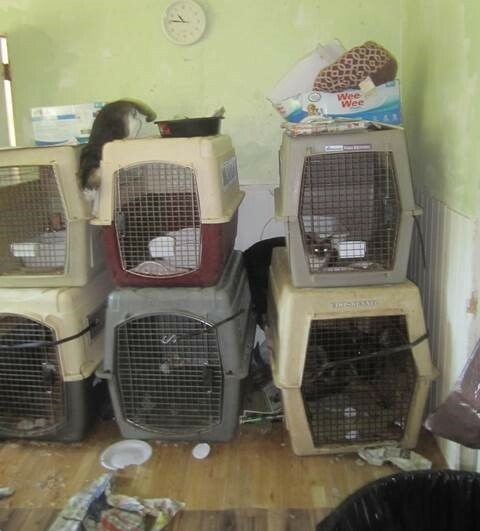 Many of the dogs and cats were locked in filthy plastic kennels, forced to step in and lie in their own waste. Most of the house did not have electricity or ventilation, and there was little food on the premises. The exotic birds, including five cockatoos, two macaws, two conures, and an amazon parrot, were closed up in a room without light or ventilation. “The animals were living in extremely unsanitary and cramped conditions. Many were sick and in need of immediate medical care. In fact there wasn’t an animal on the property who didn’t need help,” says Melinda Szabelski, Animal Cruelty and Rescue Supervisor for HSHV. “This case seems to fit into an ugly but all too common problem; people who claim to be rescuing animals, but are actually doing more harm than good because they don’t have the resources to ensure even basic standards of care. Commonly they can’t even recognize the suffering in front of them. No homeless animal in Washtenaw County ever needs to be kept in these conditions. A reminder again to the pet loving public, please make sure to see the quality of care being provided before getting or giving any individual or group an animal, no matter who they are and how well intentioned they seem,” said HSHV’s CEO, Tanya Hilgendorf. Under Michigan Penal Code Act 328 of 1931 Section 750.50, failure to provide adequate care involving 10 or more animals constitutes a felony, punishable by imprisonment of up to 4 years and/or a fine up to $5000 and/or community service for up to 500 hours, plus possibly being ordered to pay the costs of prosecution. HSHV often runs at capacity during the summer, and encourages those looking for an animal companion to adopt.